In the REAL WORLD, do we write just ONE mode in isolation? With a strong focus on writing and the writing process, WORDSMITH: COLLEGE WRITING, Second Edition also groups the methods of development in threes -- to better show students the relationships between them, and to give students strategies for using more than one in their papers: TheShowing and Tellingchapter covers Description, Narration, and Example. TheLimiting and Orderingchapter covers Definition, Classification, and Process. TheExamining Logical Connectionschapter covers Comparison-Contrast, Cause-Effect, and Argument. Throughout the text, WORDSMITH: A GUIDE TO PARAGRAPHS AND SHORT ESSAYS 2E also provides extensive exercises for students to practice their skills: PracticeandReview Exercisesare brief, short-answer style exercises. Editing, GroupandWriting Assignmentsrequire working with or creating writing samples. Progressive Writing Assignmentsconnect writing process concepts from other chapters. 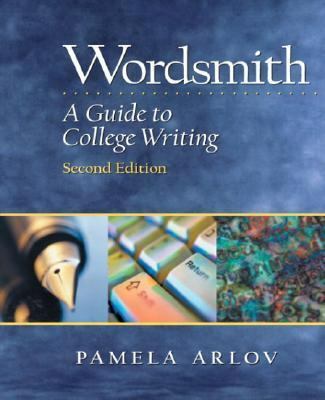 With a focus on writing and a variety of exercises, WORDSMITH: A GUIDE TO COLLEGE WRITING 2E illustrates how the elements of good writing are rarely performed in isolation.Arlov, Pamela is the author of 'Wordsmith A Guide to College Writing', published 0012 under ISBN 9780130488961 and ISBN 0130488968.